All over the world people are looking forward to the coming Easter Sunday. It is an occasion for getting together again with friends and family and to celebrate this joyful time. Unfortunately, there are people we would love to spend this festive holiday with who are far away. Out of sight doesn’t mean out of mind. Let’s reach out to all your loved ones with cute and funny Easter cards. I will help you quickly design a unique Easter card. Let’s just dive right in together. Are you ready? We have to find a background to make our Easter card lively and cool. The theme is Easter, so we will narrow our choice down to some Easter symbols. For example, Easter eggs, chicks in hatched out eggs and Easter bunnies are well-known as Easter symbols. They have their story and play an important role in Easter celebration. Unless we decide to use a solid background or a family picture, we know how our background could look like. Images of eggs attract me. What do you think? I suggest to start from this kind of image. Here are 3 images that caught my attention when I was going through Pikiz gallery. We will size our image before we continue. At times, it is hard to express ourselves. Don’t stress! It is a message for loved ones, not an exam essay. If I have an advice for you, be yourself! Trust in your ability to be nice and draft; draft until you are satisfied. Easter fills us with hope, joy and happiness. We want to share the same feelings in our message. Let’s make it sincere and funny. You don’t need to be wordy. Remember you can say more with less. Now it is time to select the most expressive and the right fonts. Two principles I want us to follow at this stage are those of readability and attractiveness. We will take into account the typefaces which match our background, the size and the best position for our message on the background. I am choosing emotional types because they convey messages strongly. Make no mistake about it, colors also have significance during Easter. Color are so fascinating that we can overuse them unconsciously. Don’t be tempted! I want us to understand colors and use them knowingly and carefully. Here is your palette of colors. We will make our choice considering them. RED: Is associated with the blood Jesus Christ shed for mankind. It is then symbol of love and sacrifice for the goodness of humanity. WHITE: Signifies purity and grace. GREEN: Brings rays of hope; it is the color of grass. PURPLE: Is indicative of royalty. It is said to bring wealth. YELLOW: Is related to the brightness of sun. It’s a color that brings joy and happiness. ORANGE: Represents hope and is associated with the dawn of day. ROSE: Signifies joy and jubilation. Finishing touch and ready to be shared! Our Easter card is almost ready. I feel like there is something missing… a finishing touch. I think stickers can do the job. They will help us illuminate our card and give it a festive tone. 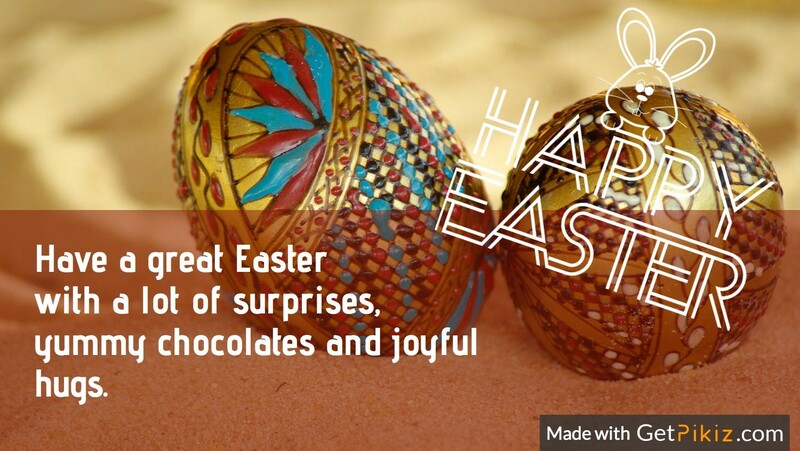 See how it was easy and quick to design our Easter greeting card. It is time to share. I hope you enjoy the time spent together. If you have any questions, please leave a comment and I will reply to them. You can download Pikiz from the extension page if you don’t have it yet. Sending you a basket full love!